Sunny Leone And Daniel Weber celebrate their wedding anniversary with a passionate kiss. 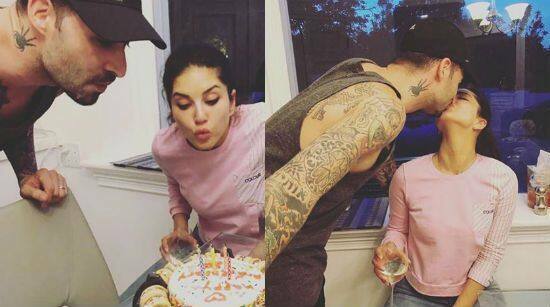 Sunny Leone and her husband Daniel Weber are a lovey-dovey couple and it’s a sight to watch them together whenever they share romantic pictures. Daniel and Sunny are married for 8 years now but their companionship is as amazing as that of a newlywed. These two lovebirds are blessed with three babies – elder daughter Nisha Kaur and twins Asher-Noah Singh. On their wedding anniversary, Sunny Leone took to media sharing app Instagram to share some of the beautiful pictures of herself, Daniel and Nisha. They can be seen spending some quality time together. While sharing anniversary pictures, Sunny also revealed that their baby daughter Nisha had a sweet little surprise for the couple. The caption says, “Happy Anniversary @dirrty99 you are the best part of my life, my best friend and the best father to our children! the greatest part is that our daughter made us our cake”. Daniel also shared the same pictures with a romantic caption, “Happy anniversary baby love !!!! Just getting started !!!  thank you for being the most grounded and loving person I have ever met in life !!!! Xoxoxo @sunnyleone”. Sunny married Daniel after dating him for a long time. She has revealed on many occasions that he is her pillar of support and has been there for her through all thicks and thins. She also shared her story with Humans of Bombay. The post started with, ““We met through Daniel’s band mate at a club in Vegas. He says it was love at 1st sight, not for me though, because all we did was make small talk–there weren’t any floating hearts or violins. But somehow he got my number & email ID. What I liked is that he didn’t call me, but emailed me instead–that’s how we began talking. Coincidentally, I was going to NY, where he lived when he emailed me saying, ‘You’re never going to give me your number, are you?’ Which is when I gave in & he asked me out. I was late for our 1st date. But like a gentleman, he waited patiently. When I reached & we started talking–there was the violin moment. The whole restaurant disappeared & it was just us. We spoke for 3 hours–it was like I’d known him forever. We had a long courtship–in the beginning, it was just us getting to know each other. I remember when I was in Oman–he sent me a mixed CD & flowers from across the world! I had a stack of calling cards because of how much we spoke! I was in love. He’s so considerate & supportive. In fact, because he wasn’t comfortable with me working with other men in my adult films, he began working with me & we started our own company. Within a few months of dating, my mom passed away. I’d expect a guy to run from such an emotional responsibility–but he stayed. Not only for me, but for my family. I’d wake up crying at night & he’d hold me. He didn’t try to fix the situation–he was present & that’s what mattered. I knew then that he was the one, but it was his turn to make me wait. YES!! I was jumping–how could I not? I’m so lucky to have him. The proposal was simple–exactly how I wanted it.